After some pretty excting weeks, I am finally back with a new edition of my CNA weekly. I had the pleasure to attend KubeCon in Copenhagen and I am still amazed by all the great sessions & collaborative culture across the event. I had so many energizing conversations and can only confirm the observations that my colleague Tim shared in his blogpost about the “hallway track“. VIC 1.4 has been released earlier this week. It includes many new features such as support for Remote Office, Branch Office (ROBO) usecases outside of the core datacenters. In that context, Harbor 1.4 has also been released. DRS Affinity for placement across availability zones/failure domains, etc. 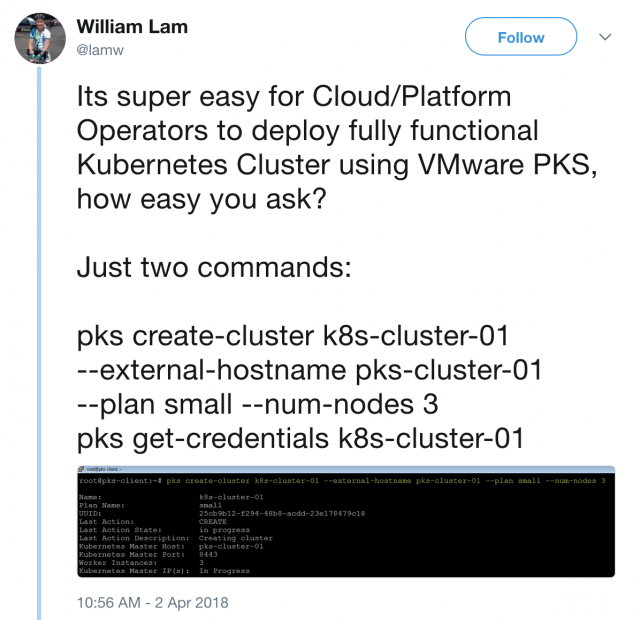 William Lam (@lamw) has continued his work on the Getting started with VMware Pivotal Container Service (PKS) blogpost series with a few more blogposts: Overview, PKS Client, NSX-T, Ops Manager and BOSH, PKS Control Plane, Kubernetes Go!, Harbor, Monitoring Tool Overview, Logging, Infrastructure Monitoring, Application Monitoring! Wow – what an exciting time! While I am super energized about all the news in cloud-native land, I always love to see a new generation of VMware’s core stack being released. All hypervisor and management software (vSphere) got a significant update and there are tons of highly interesting updates that could also impact cloud-native platforms running on top of it. Just check out e.g. VMFork that is now part of the core hypervisor in version 6.7 and imagine the possibilities. What is VMFork you ask? VMFork enables “forking” instances of a live, powered-on VM, each with its own unique identity. By leveraging the existing linked-clone technology for disks and extending the hypervisor to enable Copy-on-Write memory and VM state, VMFork fosters instant creation of VMs with little CPU overhead. William Lam already blogged about some examples as well. But I am just scratching the surface here – learn more about the updates from the linked blogposts below… and now into the content! The world is gathering in Hannover/Germany this week for the Hannover Messe to discuss Industry 4.0 and Digital Transformation across industries. VMware is showcasing some of the solutions at the edge and IoT space as well – find out more in the video on Hannover Messe’s website. My great colleague Tom Scanlan worked on a slightly smaller IoT & Kubernetes usecase and released a new blog article titled “Winery Application Demo: IoT Pipeline with Kubernetes on vSphere” – great read! As I mentioned on a previous edition of my updates, there is now a dedicated Special Interest Group (SIG) in the Kubernetes Community that is focussed on VMware. Our colleagues outlined more about the structure, purpose and how to engage with the SIG in a recent blog article. William Lam keeps blogging about Pivotal Container Service. This week it’s about a Monitoring Tool Overview – by the way: the Wavefront team also released a blog article on Develop Cloud-Native Applications, Leave the Heavy Lifting of Monitoring to Wavefront which also includes a pretty cool 8 minute demo! Besides William’s excellent series, my colleague Cormac Hogan also shared a great blogpost around a very simple Pivotal Container Service deployment. There is now also a free new ebook on “Accelerating Digital Transformation with Containers and Kubernetes” available from VMware. The book “introduces you to containers and Kubernetes, explains their business value, explores their use cases, and illuminates how they can accelerate your organization’s digital transformation“. KubeCon is just around the corner. Make sure to add The NewStack Pancake Breakfast & Podcast: Securing Kubernetes to your schedule! 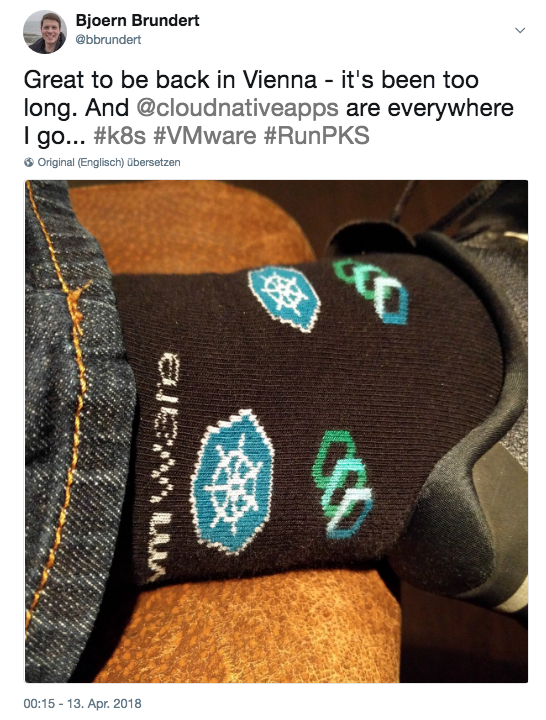 Please reach out if you are attending KubeCon – VMware is a Diamond Sponsor this year and we will have a presence there as well! Speaking of PKS: there will be a PKS roadshow across the US and then coming to cities across Europe very soon. Make sure to sign-up here if you are interested in learning more. I’ll publish additional dates as soon as they are releases. At the same time, NSX-T and the NSX Container Plugin (NCP) have been released in version 2.1.2. NSX-T now supports Kubernetes 1.10. Speaking of NSX-T: the team just released a Terraform provider for NSX-T and demonstrates its capabilities in a 20min video focused on Infrastructure as Code with NSX-T.
VMware Distributed Resource Scheduler (DRS) has been embedded in VMware’s core virtualization product for over a decade and VMware customer are leveraging its algorithms to let the infrastructure load-balance itself in a “driverless” fashion. A newly released whitepaper gives some insights into what’s new and what’s current with vSphere 6.5’s implementation of DRS and explains many of the concepts and metrics in more detail. I somehow missed the release of a great whitepaper titled “Performance of Enterprise Web Applications in Docker Containers on VMware vSphere 6.5“. Welcome back to another edition of the CNA weekly! Sorry for the slight delay with this edition – I am still aiming for a weekly cadence. But lets kick-off this Monday with some fresh content! Just recently, Kubernetes 1.10 has been released. Read more about it by my (new) colleagues Clint and Vladimir in their blogpost here. Find out more on the official K8s blog here. Are you planning to attend KubeCon in Copenhagen in May? Are you interested in getting involved in VMware & Kubernetes? Join the VMware SIG (Special Interest Group) meeting on Thursday, May 3 from 11:55 – 12:30! The SIG site can be found here. From the series “back to basics“: vSphere HA Restart Priority – another great blogpost from my colleague Duncan. Make sure to get the configuration for you cluster management and worker VMs right! The VMware Open Source team shares some thoughts about maintaining large open source projects as well as five “secret” practices for Open Source success. Some great news for Platform Operators: vRealize Operations & Wavefront are getting a close integration as part of the vROps 6.7 release. Read more about the integration here. My colleague Alex Ellis has recently written an interesting blogpost about how to move your project to Kubernetes – he is sharing is learnings from the OpenFaaS community from the past 12 months. There will be a “Kubernetes in the Enterprise” session in Pivotal’s London office on March 28. Learn more about Pivotal Container Service and Developer-Ready Infrastructure! “PKS was selected for its deep integration with the existing VMware SDDC environment including not only vSphere, but also networking, storage and management tools, which makes PKS one of the most comprehensive solutions for managing containers today. According to our survey, integration with existing infrastructure is the number one priority of enterprises looking for a container management platform,” says Torsten Volk, Managing Research Director, EMA. Performance and Capacity Management of Virtual Container Hosts in vSphere Integrated Containers can be easily achieved with vRealize Operations. A handy guide gives an overview about how to leverage Supermetrics for resource pools that can be applied for VCHs as well. I am a big fan of vRealize Operations for Infrastructure Operations and Wavefront for Application-level operations. Platform Realiability Engineers will be involved in Infrastructure-, Platform- and Application-level discussions – what could be better than bringing vRealize Operations and Wavefront even closer together? Dispatch Functions Framework (a batteries-included open-source enterprise functions framework) has now a new website at dispatchframework.io, and a Twitter handle! My colleague in the Open Source team Alex Ellis wrote an interesting blogpost on Your first serverless Python function with OpenFaaS back in August. The well-known Cloud Native Computing Foundation Landscape has been released as an interactive version last week. The static view of the landscape can be found here. VMware might just have cracked the container market with NSX – great comments from “The Register”.